In the meantime (while we’re dusting off our résumés), let’s look at some of the not-so-intelligent editing apps that are popping up on the internet. Do they really work? Are they a threat to our livelihood? Or are they tools we can use to enhance our productivity? AutoCrit, aimed mainly at writers of fiction, might also be useful for editors of fiction. It claims to check dialog, writing strength, word choice, repetition, and much more. It also compares your manuscript to other works of fiction to see how yours stacks up. You can take the tour and explore the features. AutoCrit allows you to check a writing sample online but, as far as I can tell, it won’t provide a full report unless you sign up for a monthly subscription of $29.97. You can cancel at any time and receive a full refund within your first fourteen days of use. Unfortunately, I couldn’t find a way to download a complete report all in one file. And now, I’m impressed. After I typed the paragraph above, the Grammarly add-in informed me that Bulwer Lytton should be hyphenated: Bulwer-Lytton. And that’s right, of course, so the program is much smarter than I anticipated. On the other hand, the add-in disables Word’s Undo feature (CTRL-Z), which to me is unacceptable. Grammarly gives you a partial analysis of your text at no charge, but for “advanced issues” it requires a monthly subscription of $29.95. You can get a full refund within the first seven days of use. I also fed it my short story “Nippers,” which purposely uses bad grammar in its first-person narration. You can see the results at The Editorium. When I first visited the Hemingway website, I had a hard time understanding how to use it. Fortunately, the “Help” page explains what to do: “Begin your document by clicking the ‘Write’ button. This will fade out the editing tools, transferring Hemingway into distraction-free writing mode. Here, you can work out your first draft free from our highlighting. Once you’re finished, click ‘Edit’ to transition back to editing mode. 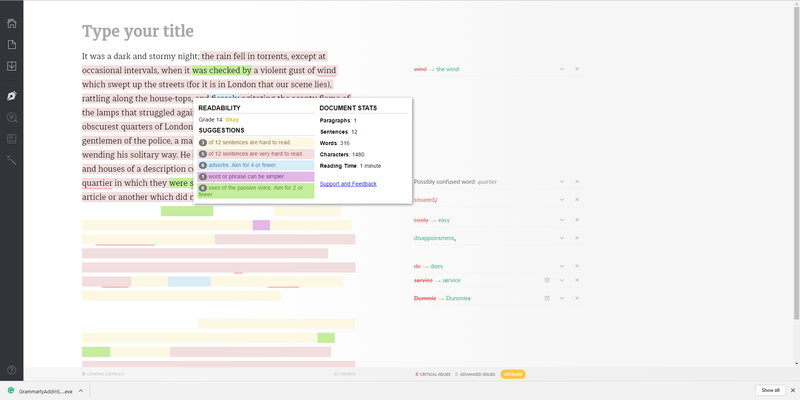 Now you can make changes with real-time Hemingway feedback. Tighten up your prose, clear the highlights, and then share your work with the masses.” The online version is free to use. The desktop app (both Mac and Windows) is $19.99. After using the app, you can save your work as a regular Word document. Cyan = adverbs. I have 32, and Hemingway is recommending 17 or fewer. Green = passive voice. I have just 5 uses, well below the recommended 37 or fewer. Magenta = phrases that have simpler alternatives. Yellow = sentences that are hard to read. Red = sentences that are very hard to read. The idea is to keep editing until all of the colors are gone. In actual practice, you won’t want to do that, unless you enjoy lots of short, choppy sentences. Unfortunately, it’s not possible to download Hemingway’s results as a separate file, as Hemingway is designed as an online writing tool. However, the Hemingway desktop app does make this possible. You can learn more about Hemingway here. I think out of AutoCrit, Grammarly, and Hemingway, the one program I might consistently use is Hemingway, just because it’s simple yet offers some useful observations, although I would feel free to ignore them. I also tried Orwell and Ginger, but neither seemed to work well for me. Orwell seemed clunky and buggy, while Ginger seemed rather basic, although its ability to rephrase an awkward sentence is impressive. If you’ve seen other editing programs I’ve overlooked, please let me know. Here is another roundup by the NY Book Editors, which includes additional editing tools. It seems everyone is trying to get in on the act. The programs I’ve featured here are useful in their own way, but they still require the educated eye of a human editor to decide which of their suggested changes make sense—something that I don’t think will change anytime soon. What do you think? Will computers ever be capable of editing on their own? If so, how could we turn that to our advantage as editors? And how can we take advantage of the tools that are already available? I’d love to hear your thoughts about this.